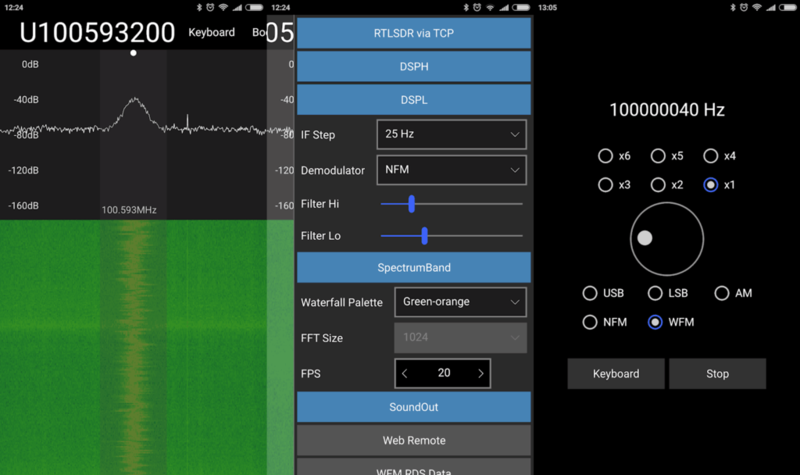 Radwave is a recently released Android App for RTL-SDR dongles. It provides a real time waterfall of the RF spectrum, and it's defining feature is that you can easily zoom, pause and rewind the spectrum at any time. The software is currently in beta, and doesn't demodulate any signals, but the work and ideas behind the spectrum display features is really interesting. Radwave utilizes RTL-SDR dongles and the RTL2832U driver app to allow people to interactively explore the RF spectrum. You can dynamically zoom in and out in time and frequency, pause, and go back in time - all without losing any samples. If you find something cool, tag it and share with friends. Radwave core technology is its interactive real-time spectrogram. It shows all the spectrum - utilizing every sample1 - for the entire collection2. Frequencies are aligned over time as you change the RF center frequency3, helping you make sense of what you see. Radwave Intro - We're in Beta! Thank you to Giuseppe (IT9YBG) who just wanted to write in and note that Android TV boxes are an excellent computing platform for RTL-SDR dongles. They allow you to monitor frequencies or listen to DAB music directly from a TV, and at the same time there is no need to worry about battery consumption. Giuseppe notes that using an Android TV box for SDR is as simple as installing the Martin Marinov Android RTL-SDR drivers from the Google Play store, and then downloading the SDR apps that interest you. No extra USB OTG cable is required, just plug the dongle into the back of the device. In his post he shows screenshots from apps like SDRTouch, welle.io DAB+, RTL-SDR AIS and SDRoid all running smoothly on his Android TV box. With a system like this is it probably also a good idea to connect a wireless keyboard/mouse combination into a USB port as well. Over on YouTube, channel Null Byte has uploaded a video showing us how to use an RTL-SDR V3 on an Android smartphone. In the video he discusses the hardware and software required to get started on Android and demonstrates the free SDRoid Android app (based on RFAnalyzer) by tuning to several signals including a voice signal. Later in the video he also shows an ADS-B app for receiving aircraft positions. The video is intended for people new to RTL-SDR so it is a little basic, but it's a great introduction. He notes that the next video (which will probably be released in a week) will show RPiTX being used with the RTL-SDR. QuestaSDR - powerful and flexible, cross-platform Software Defined Radio Application (SDR). Built-in scheduler architecture provides integrate plugins, plugins kits and multi - UI. Typical applications are DXing, Ham Radio, Radio Astronomy and Spectrum analysis. - USB OTG Cable - used to connect a RTLSDR to your Android device. Connect the USB dongle to the USB-OTG, then insert the free end of the cable into the USB port of your Android device and launch the QuestaSDR! Now you can listen to live frequency range shortwave, VHF, UHF. Feedback and bug reports are always welcome. Please note that I am not responsible for any legal issues caused by the use of this application. Be responsible and familiarize yourself with local laws before using. QRadioLink is a Linux and Android compatible radio app that can run on smartphones. It can be used to receive and transmit digital radio signals with a compatible SDR such as an RTL-SDR (RX only), or a LimeSDR Mini (TX and RX). The following video by Adrian M shows QRadioLink running on an Android phone with a LimeSDR Mini connected to it. An external battery pack is also connected to maintain power levels over a longer time. In the video Adrian shows how this combination can be used as a fully portable radio transceiver. The video first shows him receiving broadcast FM, digital amateur radio voice (Codec2 & Opus is supported), narrowband FM and SSB signals. Later in the video he transmits a digital voice signal using the microphone on his Android phone. He notes that an external amplifier would still be needed if you wanted more transmission power. QRadioLink is a building platform which allows experimenting with VHF-UHF SDR transceivers using different modulation schemes for digital data transmissions. So far digital voice and text transmission is supported, using either a narrow band modem and Codec2 or a high bandwidth modem and Opus. Supported hardware includes the RTL-SDR, Ettus USRP, HackRF, BladeRF and in general all devices supported by libgnuradio-osmosdr. 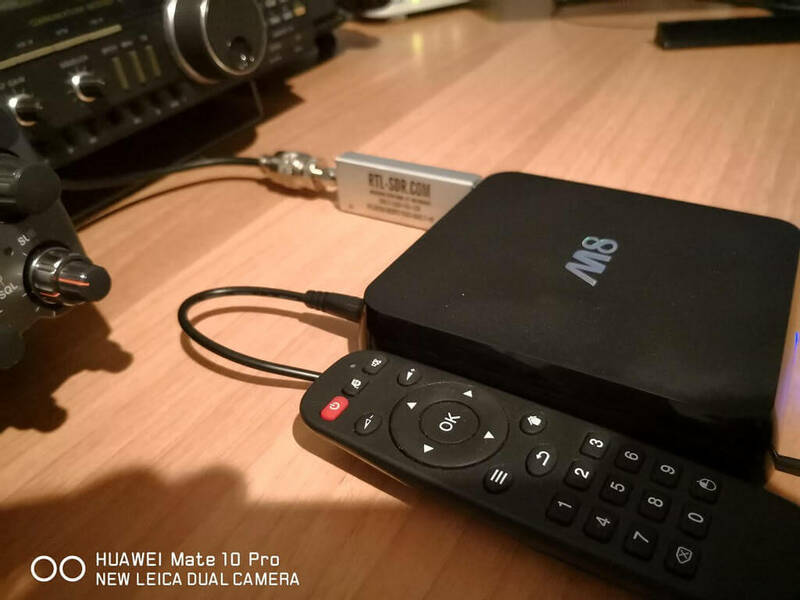 Over on Twitter @lambdaprog and @mm6dos, developers of SDR# and Airspy SDR products have tweeted videos showing off an Android watch being used as an SDR interface. They use a prototype of their upcoming Airspy HF+ SDR, their SpyServer streaming software and an Android watch. The Android watch receives the streaming FFT and audio data from a server running the SpyServer and Airspy HF+. They write that this new SpyServer client is mainly for phones and tablets and is efficient enough to run on a watch. It appears that this lightweight version of the SpyServer sends compressed FFT and audio instead of a slice of the IQ data like the current SpyServer, making it very light on the client side CPU and network usage. If you’re interested in the Airspy HF+ we have an initial review available here. Last month we posted about Aerial TV, a new Android based DVB-T decoder that works with RTL-SDR dongles. Back then the app was still in beta testing and had a few operational bugs. 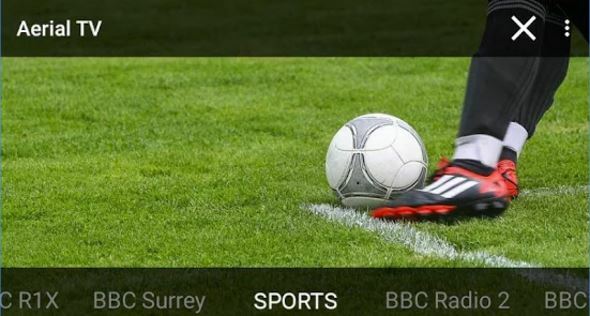 Now the Aerial TV app has been officially released. UPDATE: Due to Google policies Aerial TV has been removed from the Google Play Store. It is claimed that Aerial TV could be used for copyright violation. It is now available on the Amazon store. Official information will always be available on the new official website at aerialtv.eu. The app is based on the new Android DVB-T driver for RTL2832U devices which is written by Martin Marinov who is also the programmer of Aerial TV. The DVB-T driver is open source, and currently supports RTL2832U devices with the R820T, E4000, R828D, FC0012 and FC0013 tuner chips. Of note is that the R828D also has DVB-T2 support. Aerial TV is free to download and test, but requires a $7.99 licence to use for more than 30 minutes. To use it you will need an OTG (On-the-go) cable adapter and an RTL-SDR dongle with antenna. Just watch TV – no data plan or wifi connection required. Aerial TV works by picking up digital TV channels off the air with a regular TV antenna. You will need a low cost USB TV tuner. You can grab one online for less than €10. Make sure to get an RTL2832 tuner. When it arrives, just connect the provided antenna and start watching. You may need a USB OTG cable to plug the tuner in your Android device. USB OTG cables are inexpensive and easy to find. Note that your Android device must support USB OTG. If unsure, do a quick search online or consult your Android device manual. Also check that there is DVB-T/DVB-T2 service in your local area by doing a quick search online. Signal needs to be strong enough for Aerial TV to pick it up. For best results use an outdoor aerial. You get free unlimited access to radio forever. You also get to watch all TV channels and experience all features of Aerial TV during the trial period for free. After the trial period ends you can make a one-off purchase and watch as much TV as you want. Remember: you can keep listening to radio even if the trial has ended! Q: How do I find a supported dongle? A: All major RTL2832 (rtl-sdr) dongles are supported. These dongles can be easily purchased online. Just type in “RTL2832” or “RTL2832U” in the search box of your favourite online store. Q: What tuner do I need to watch DVB-T2? A: If your country has DVB-T2 broadcasts (such as Freeview HD in UK) you will need a DVB-T2 compatible receiver dongle such as R828D in order to watch DVB-T2 with Aerial TV.